Breakfast joint? Check. Brew pub? Check. Wine and cheese shop? Check. Sophisticated culinary hot spot for a dinner date without kids? Check. It appears little Weaverville has built itself a bona fide restaurant scene. Sometime between the Great Recession and today, downtown’s Main Street defied the slow economy and added enough niche restaurants to give north Buncombe residents reason to stick around when it’s time to eat out. Now you can meet up with friends at the coffee shop, and then grab a French treat at the new crêperie. Later, listen to live music while waiting for your gourmet pizza to come out hot from the oven. Main Street now packs many great new dining options among the longtime favorites. Glass Onion proves that upscale dining doesn’t need to be fussy. The husband-and-wife owners specialize in modern takes on northern Italian standards like cannelloni Florentine, wild boar Bolognese, and creamy Gorgonzola polenta. They also serve Sunday brunch. Check out the Wine Lovers Wednesday specials. Operated by the same folks who own Asheville’s beloved Jack of the Wood and Green Man Brewing, the less-gritty Jack of Hearts stocks a similarly deep selection of local and national craft brews. Offering more than just a good pour, Jack of Hearts is aimed at the lunch and dinner crowds. Chef Bill Klein, formerly of Fig and Biltmore Estate’s Bistro, recently took over the kitchen, so expect new flavors on the menu this summer. 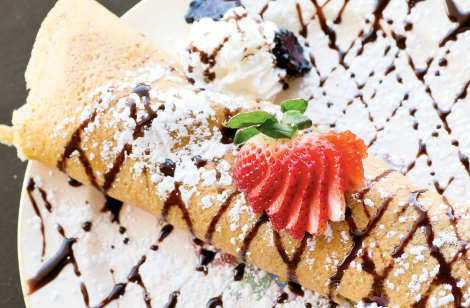 Located on the north end of downtown, this small restaurant offers gluten-free crêpes with a selection of fillings that stray from the classic French choices. The barbecue and Cuban crêpes hold pulled pork. For dessert, don’t miss The Presley filled with Nutella, bacon, peanut butter, and bananas. A cozy shop next door to Maggie B’s, Allgood is the place to let your inner coffee snob run wild. The baristas can suggest the ideal cup of locally roasted joe and even consult you on the exact temperature that it will be served, which plays a part in its flavor. Every neighborhood deserves a friendly burger joint like this. It’s a perfect stop for that après-hike recharge. You can’t go wrong with hand-tossed pizzas and live music. Try the Olympus pie, covered with spinach, feta, and garlic. This town hangout for foodies recently relocated to a larger space down the road. If you’re hosting a party, stop in for a bottle of Prosecco, yummy cheeses, and cured meats from Italy. For breakfast, don’t miss the ultra-rich French toast casserole. And for an afternoon snack, bring a friend to help you summit the Mountain Éclair.